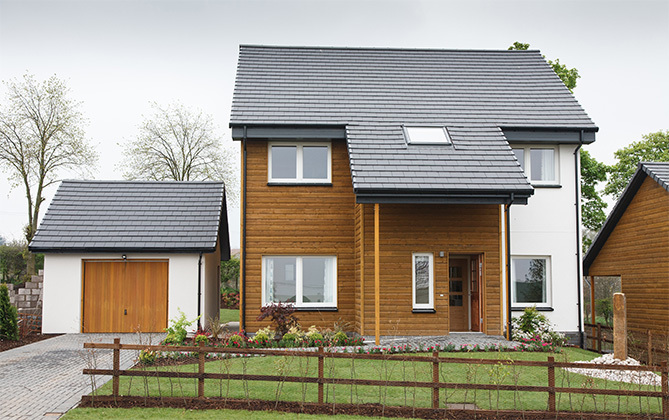 A unique eco-project on the site of a former cottage hospital at Spittal Gardens in Loanhead, on the outskirts of Edinburgh, has opened a flagship five-bedroom home to launch the first phase of five homes, with only nine planned in total. Built by Edinburgh-based Eskgrove Homes and part of the £4.75 million Wadingburn development in Loanhead, the £679,000 showhome incorporates a stand-out design and green credentials – appropriately set against a backdrop of farmland – that include a built-in air source heat designed to enable substantial energy efficiency savings compared to similar new build homes. Furthering the property’s green credentials, all the building materials have been responsibly sourced and include clay tiles and solid wood cladding to create a sharp and modern look. Inside, standout features include a double-height dining room and solid oak staircase. Rob McGregor, of marketing agent Gilson Gray Property Services, says: “We are delighted to be involved in this highly impressive eco-development and at £679,000 the showhome offers all the traits of a seven-figure home. It truly makes for a perfect family home – lots of space, natural finishes, lower energy bills and close to Edinburgh.” Viewings are by appointment only – contact Gilson Gray’s Edinburgh office to arrange.